The complications and tricky negotiations of family, as siblings grow up and leave to establish their own lives and their own families, was a central theme of numerous films at the 2007 Toronto International Film Festival. Two of the best films from that festival, Olivier Assayas’ Summer Hours (L’heure d’ete) and Hirozaku Kore-Eda’s Still Walking, highlight the opening weekend of the 2009 edition of the Seattle International Film Festival. Jeremie Renier, Juliette Binoche and Charles Berling in "Summer Hours"
Summer Hours is like a miniature, a small film of small dramas in the scope of large lives. Mortally once again hangs over the story of a family estate and the rich treasures of art history that goes with it. Family matriarch Helene (Edith Scob) has preserved the country home of her famous painter uncle as a tribute to him, complete with unpreserved works by French masters on the walls and rare pieces of furniture and glassworks as household items, and she drills in her eldest the list of valuables that need be accounted for and, if necessary, sold off when she dies. FrÃ©dÃ©ric (Charles Berling), who lives nearby in Paris, can’t bear to see the home broken up and sold off, but with his sister (Juliette Binoche) thriving in New York and younger brother (JÃ©rÃ©mie Renier) settling in China, the holiday family home no longer has the same meaning to them all, let alone their children. The film moves from one decision to another and the arguments that inevitably ensue and it’s not all that subtly engineered. What Assayas brings is a generosity of understanding and a warmth of character to the siblings who love one another enough not to let disagreements change their feelings. It’s a gentle look at the way the ties to the past lose their hold on the next generations, and it closes with a pair of sequences that alone would recommend the film: one that takes you through the Musee D’Orsay from the workshops through to the galleries, and a final scene that recalls his brilliant (and still unavailable on DVD) early feature Cold Water, but with the angry, rebellious destructiveness of the earlier film replaced with a warm communal celebration. Plays Friday, May 22 and Sunday, May 24. The death of an eldest son frames and almost defines Still Walking, as the family gathers to commemorate the fifteenth anniversary of the death of Junpei, who drowned saving a child swept off the nearby beach. There’s plenty of blame and disappointment to go around. The father (Yoshio Harada), once the local doctor and still eager for the honorific title in forced retirement, had put all his hope in Junpei taking his practice. His youngest, Ryo (Hiroshi Abe), now forty, has “rebelled” by becoming an art restorer, and married a young widow with a child to boot! The daughter (You) is a chatty diplomat while her husband dozes or goofs with their children during the family rituals. Mother is the thankless host, but even she can’t hide her disappointment in a grandchild that doesn’t share her family blood. There are no confrontations, here; they endure the slights and the weather the discomfort like a necessary negotiation. But genuine connection can still be briefly made made, outside of obligations and expectations, out from under the shadow of Junpei’s death, when they can just be family. Kore-Eda is marvelous with these little moments, at observing the reverberations of discomfort around the table at a family meal after a thoughtless remark or a bitter rebuke, at sensing the polite distance the parents keep from Ryo’s widowed wife, or watching the still life of a family at rest. And the film offers a simple thought that can tie both films together: “Even when people die, they don’t really go away.” Plays Saturday, May 23 and Friday, May 29. Later this week is the best American film I saw at Toronto: Kathryn Bigelow’s The Hurt Locker is not the first American film about the current Iraq war, but it’s the first to matter. It follows the finals days in the rotation of a bomb disposal unit as it gets new cowboy team leader (Jeremy Renner), a real maverick who steps up to a bomb like a gunfighter in an old west showdown, tough and swaggering and on his own terms. 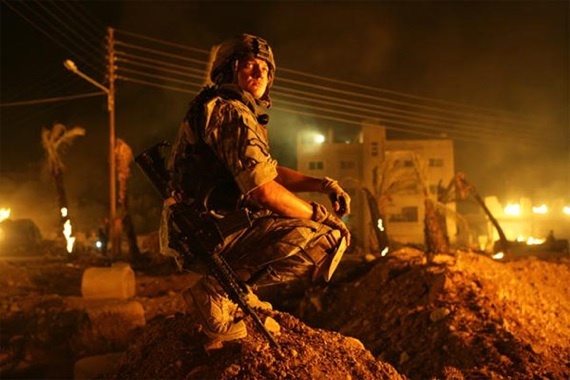 This may be the same sun-bleached Iraq of dusty dirt streets and open deserts we’ve seen in other Iraq war films, but it’s a different kind of movie. Bigelow’s handheld camerawork roams like a spotter’s eyes, always surveying, always getting another look, and the cuts are shifts of perspective that both to keep you off-balance and give a sense of how vigilant they are. Bigelow shows up how they see the world out of necessity. So many war movies get the chaos of battle and the suddenness of death. Bigelow is just as interested in the stillness, the patience, the importance of waiting until you have some certainty that there is no one else out there waiting to kill you. Renner is a man of action in the manner of a Howard Hawks hero: he’s defined by what he does and how he does it, not what he says. He’s the best at what he does, and when he does it he is in control. When he’s not, he’s just another guy looking for his place in the world. There’s no political message here, nobody questioning their mission or arguing policy. These are just men doing their jobs in an unforgiving workplace, and Bigelow, more than anything, is interested in how they do it, because the how is the difference between going home at the end of the rotation in one piece or not. Plays Thursday, May 28 and Saturday, May 30. Schedules and ticket information can be found on the SIFF website. Summer Hours opens in Seattle on May 29. The Hurt Locker is set for a June release. Still Walking has not yet been set for an American release, but I hold out hope for it.